Greeneview’s Collin Wilson (3) snares a catch during a scrimmage game at Jamestown’s Don Nock Field before the 2018 regular season got under way. Wilson was one of seven Greeneview Rams players to be named to an All-Southwest District team in Division V.
Three Bellbrook Golden Eagles players, including first team pick Justin Sloan (35), and coach Jeff Jenkins were honored as all-district choices in Division III for Southwest Ohio. Jenkins was named the district’s D-III Coach of the Year. Cedarville’s talented Brandon Pollock (26) was named to the Division V all-Southwest District squad. Carroll senior Fred Butts, shown here dragging four Fenwick tacklers and running over another, racked up over 1,000 yards as a running back. He was also a Division III all-Southwest district and Greater Catholic League Co-Ed first team defensive lineman. GREENE COUNTY — Fourteen players from the Greene County area, and one undefeated regular season coach, were among the Division III, Division V and Division VII high school football athletes honored as 2018 All-Southwest District selections. They were selected by a group of sportswriters and sports broadcasters from the Southwest Ohio region. With his Golden Eagles football team amassing an impressive 10-0 regular season record, Bellbrook head coach Jeff Jenkins was a unanimous choice as the Division III Coach of the Year for the 2018 season. The Southwestern Buckeye League Southwestern Division champions outscored opponents by an average of 36.5 points to 12.4 through 11 games. Only two teams scored 27 points or more against the Golden Eagles. Attempts to reach Jenkins for comment about his Coach of the Year selection were unsuccessful. 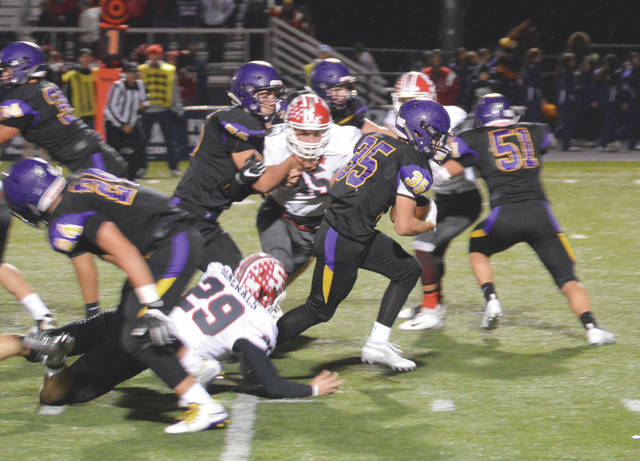 Bellbrook senior running back Justin Sloan was named to the D-III first team offense as was senior offensive tackle Ethan Knisley. Eagles senior back Sedric Ferguson was a second team all-district choice. Carroll two-way player Fred Butts, also a senior, was named to the D-III first team as a defensive lineman. His Patriots teammates, senior offensive lineman Ricardo Calzada and junior linebacker Jon LaJeunesse, were both named to the Division III all-district second team. There are presently no Greene County area schools competing at the Division IV or VI level. In Division V, Ohio Heritage Conference South division champion Greeneview had seven athletes recognized for all-district honors. That number was easily the most all-district picks among Greene County area high schools. Division II schools Xenia and Fairborn were represented by four players each, while Beavercreek (D-I), Bellbrook and Carroll (D-III) and Cedarville (D-VII) were next with three athletes each. Greeneview Rams senior quarterback Nick Clevenger and junior running back Clay Payton each were named to the Division-V district first team, junior nose guard Nick Wolfe, senior defensive back Ian Tamplin, senior receiver Collin Wilson and senior placekicker Jon Brakeall were each named to the Division V all-district second team, and senior defensive lineman Jaron Stoneburner was an Honorable Mention pick. A trio of Cedarville Indians earned first-team recognition in Division VII. 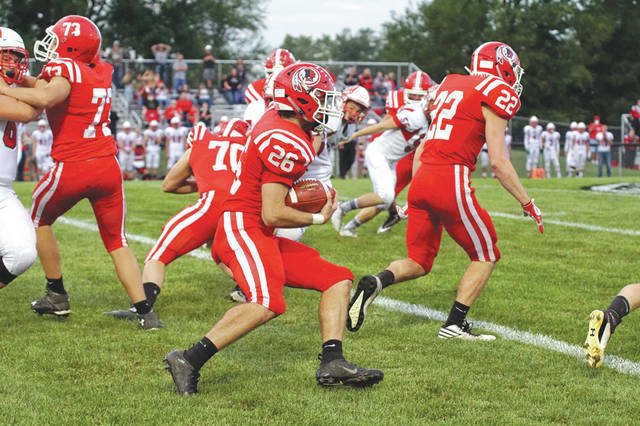 Senior running back Brandon Pollock, senior lineman Caleb Harding and senior safety Hayden Lee were each named to their respective All-District first teams. Last week, four Beavercreek football players were named to All-District teams in Division I, while a combined number of eight Xenia and Fairborn athletes earned recognition in Division II. Plus, Xenia coach Trace Smitherman was named the Coach of the Year in Division II. 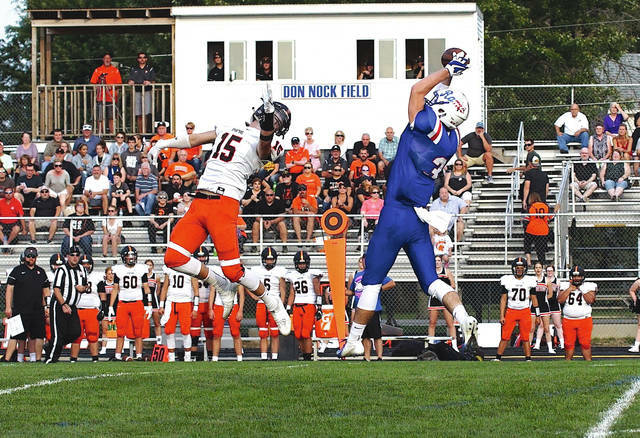 https://www.xeniagazette.com/wp-content/uploads/sites/32/2018/11/web1_RamsCatch2_PS.jpgGreeneview’s Collin Wilson (3) snares a catch during a scrimmage game at Jamestown’s Don Nock Field before the 2018 regular season got under way. Wilson was one of seven Greeneview Rams players to be named to an All-Southwest District team in Division V.
https://www.xeniagazette.com/wp-content/uploads/sites/32/2018/11/web1_JustinSloan_PS.jpgThree Bellbrook Golden Eagles players, including first team pick Justin Sloan (35), and coach Jeff Jenkins were honored as all-district choices in Division III for Southwest Ohio. Jenkins was named the district’s D-III Coach of the Year. https://www.xeniagazette.com/wp-content/uploads/sites/32/2018/11/web1_BrandonPollock_PS.jpgCedarville’s talented Brandon Pollock (26) was named to the Division V all-Southwest District squad. 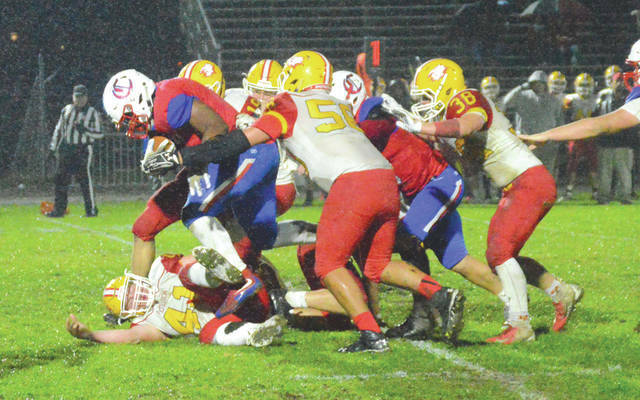 https://www.xeniagazette.com/wp-content/uploads/sites/32/2018/11/web1_ButtsGangTackled_PS.jpgCarroll senior Fred Butts, shown here dragging four Fenwick tacklers and running over another, racked up over 1,000 yards as a running back. He was also a Division III all-Southwest district and Greater Catholic League Co-Ed first team defensive lineman. A complete listing of the entire 2018 All-Southwest District team can be found on our website at xeniagazette.com/sports. Contact John Bombatch at 937-372-4444, Ext. 2123.